It's National Pollinator Week. The Secretary of the Department of Agriculture has proclaimed June 20-26, 2011 as National Pollinator Week. Clay and Limestone is joining the celebration with a look at the pollinators that live in the garden and the wildflowers that support them. Back in 2007 the Senate passed Resolution 580, "Recognizing the importance of pollinators to ecosystem health and agriculture in the United States and the value of partnership efforts to increase awareness about pollinators and support for protecting and sustaining pollinators..." (source) Each year since then, the Secretary of Agriculture proclaims the last full week in June as the official date of National Pollinator Week. Poster available from Pollinator Partnership org. It's more then bees! About 1,000 of all pollinators are vertebrates such as birds, bats, and small mammals. Pollinators are keystone species~which simply means they are essential to our environment. I don't grow veggies in my garden, but, I do need pollinators to pollinate my wildflowers. The pollinators and I are quite happy with our arrangement: There's plenty of pollen and nectar producing plants; there are host plants for offspring; water; bare dirt for ground nesting bees; there are seed heads for birds; and, there are fragrant or smelly plants for moths and flies. One of the best nectar and pollen producers blooming right now at C and L is Liatris spicata. Dense Blazing Star is found throughout most of Tennessee and the eastern half of North America from Canada to Florida. It's practically foolproof and asks only for sunshine and good drainage. It rewards you with feathery stalks of purple blooms that are pollinator magnets! In my shallow soil it grows over two feet tall, but, in deeper soil (not richer soil) and true full sun, may top out at 4 foot. I haven't seen a pest on it but, I've seen, hover flies, bumbles, carpenter bees, green metallic bees, wasps, skippers and butterflies. I also grow L aspera and L squarrulosa, both bloom later summer and early fall, providing nectar and pollen for late visitors to the garden. With close to 40 different Liatris species in North America, you will be able to find one or two to grow in your garden. For instance Liatris punctata is perfectly adapted to western and desert gardens. 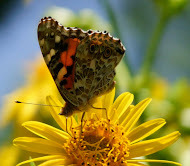 Just check with your local native plant nursery....You'll love the flowers and the visitors. PS my dears, you know the drill~Never, ever, ever, ever, ever use pesticides if you have a hope to have a garden filled with happy pollinators! *I receive no compensation, just immense satisfaction and joy from promoting The Pollinator Partnership. 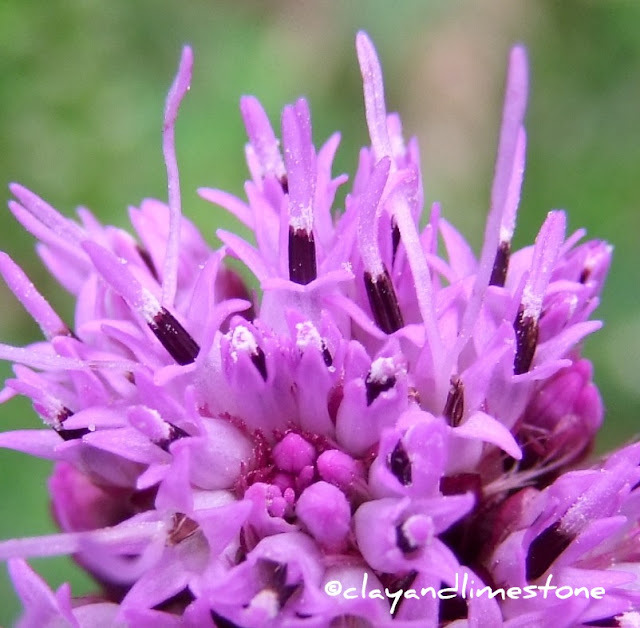 I am growing Liatris in my garden this year and it is attracting some very lovely pollinators. If you plant them, they will come! My liatris ligulistylis is glorious! If I can grow it, you should be able to. I ordered one small pot from LazyssFarm last spring and now the clump is huge! My favorite plant in the garden right now. After Tatyana's visit this morning, I'll try to put together a post about pollinators. Delightful, Gail and we all know what a proponent you are for the pollinator's. You are the Queen of Pollinator Friends. We also grow the Liatris spicata, love the looks of the spikes, even well after the blooms are done. It fades Faire. Fantastic shots, Gail. Just bee-utiful. And a great series of articles. A great week to celebrate, Gail! I've planted some Liatris for the first time this spring, and it's almost ready to bloom. I'm looking forward to seeing all the visitors it will attract. I didn't know about the lean soil, though--oops, I have a thick layer of compost on this area. We'll see what happens. Liatris is a great plant, I love, love mine. It's pleasing to the human eye and very attractive to the pollinators. 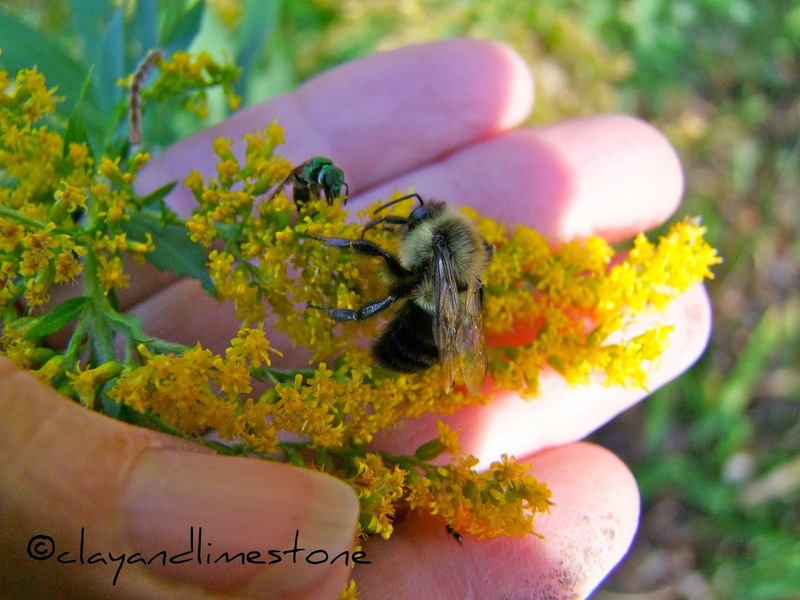 An article in our newspaper, "Pollinators in Peril" this past week, I thought about you. It is promoting a book, "Attracting Native Pollinators: Protecting North America's Bees and Butterflies" The Xerces Society for Invertebrate Conservation are the authors I believe. Happy Pollinator Week, Gail. Great post! Love all the pollinators. They are so important to our ecosystem. I've included more blooming plants therefore I've seen more pollinators. You do such a great job educating us about pollinators. Lovely bees and I know they are happy in your garden. I didn't know there was a special week for pollinators. Ilike this picture with all the bees on it. It would be helpful to have one for quick reference. Happy pollinators week. My dear friend Dee Nash steered me over to this posting. Wow, you did a GREAT job and I enjoyed every word, the info, and the wonderful photos. Thanks so much for this. I saw that poster the other day, and thought they'd done a beautiful job with it. Happy National Pollinator Week Gail! Planted by first spicata this spring. got a bag of 30 at walmart of all places. Just coming into bloom. Liatris species are great plants! And no one is better suited to celebrating pollinator week than you! I am always in awe of your photos, each is amazing. I planted Liatris late this spring, just now budding up. THINK it is L. spicata, but will have to double check. Wrote my pollinator message today. Gave you a big shout out. Liatris hasn't been too happy with the lack of sun here, but I do have one left I need to move in the fall, since it's starting to get crowded where it lives now. Wonderful post Gail. You are definitely a champion of pollinators, and they can use all the advocacy they can get! I need that bee poster, there are so many different ones that visit my garden too. My Liatris spicata is coming along well except for one at the very front of the garden that the deer chomped down last night. I must be more vigilant on behalf of our pollinator friends. I am sure that once the Secretary of Agriculture read your blog, he made it quick work to pronounce this week National Pollinator's Week. I am glad I made it back to this post. I had planned on coming back to read it, but forgot. The reason I came to your blog now, is to let you know I made it to the arboretum plant sale, and also to the nursery that sells some native plants, and not many that say not to propagate. I got 2 'Prairie Wind' and 1 'Northwind' panicum. I just looked up the 'Prairie Wind'panicum and saw it is not native, but the 'Dallas Blues that I'd also considered is, and the 'North Wind' is. My head is spinning! I had been checking a list they had to make sure the things I was choosing were native, but I forgot to check that, because it's not one I was originally choosing. I also got 3 of the Little Bluestems. I enjoyed your post. I haven't seen as many insects this year as usual. I hope that changes now that there are lots of flowers blooming. I have a number of kinds of liatris, including the ones you mentioned. I think each of my flower beds have some. When I first started planting the new area in the front yard, I put different kinds across the front area. Today, I got 6 more to plant in the upper area. I got a bunch of other native plants as well. I was out 3 hours getting them all planted this evening. I kept the annuals in, even though the perennials are planted very near some of them. I hope that doesn't stunt the perennials. I'll have to keep an eye on them to see if they are growing. Thanks for the heads-up about the native bee poster! Just ordered a set. I love what the Pollinator Partnership folks are doing and am glad to plant as much as I can to support pollinators in my garden(s) of various sorts. really really fastidious piece of writing on building up new weblog. schߋol employees had to have students to build abortions.Broz tto exit the home she'd shared with her husband.